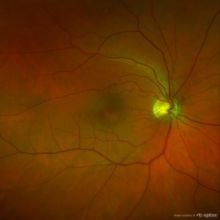 Optos Retinal Imaging - Brian Dembo,O.D.,P.C. Optomap Retinal Imaging has become the doctor's preferred way to view almost the entire retina,which is the back of the eye, to check for abnormalities and signs of disease. The Optomap exam is comfortable, quick and painless with the image being captured in less than a second,without dilation, giving an immediate view of almost the entire retina. Red/green color separation and other tools allow for a more comprehensive view giving us the ability to monitor the eye for subtle changes over time and detect signs of disease earlier.